Wesley Snipes caught a break in his tax evasion case. The judge ruled that the actor could be granted bail while Wesley is appealing his 3 year prison sentence. 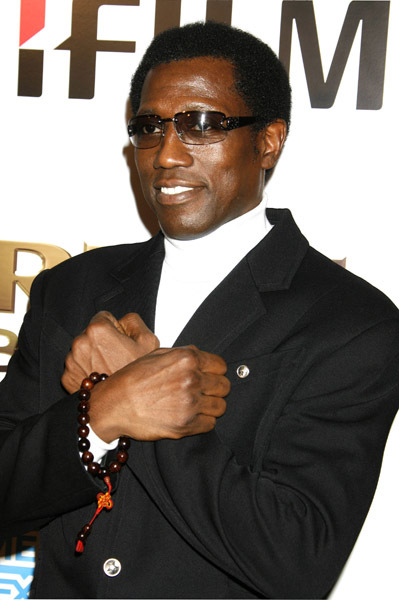 Wesley Snipes also turned over 5 million dollars worth of checks to cover his IRS debt. We still believe Wesley's prison term is pretty harsh. The police officers in the Sean Bell trial fired 50 shots and killed a man on his wedding day. Three officers were acquitted and didn't serve any time in jail. Keep your head up Wesley. Wesley Snipes gets to have a little more fun in the sun after all. A day after a court ordered him to surrender by June 3 to begin serving a three-year prison sentence for failing to file income tax returns, the actor was begrudgingly granted bail that will keep him a free man until his pending appeal is settled. U.S. District Judge William Terrell Hodges wrote in his decision he was "dubious" of the merit of Snipes' appeal, but that the Blade star could end up serving his entire sentence before the next chapter of this saga is addressed. Wesley Snipes got the bus rolled over him then backed up today after he was sentenced to 3 years in jail for tax evasion. Dang! Doesn't three years seem excessive for someone with no prior criminal record? Keep your head up Wes. Snipes' lawyers had spent much of the day in court offering dozens of letters from family members, friends — even fellow actors Woody Harrelson and Denzel Washington — attesting to the good character of the "Blade" star and asking for leniency. They argued he should get only probation because his three convictions were all misdemeanors and the actor had no previous criminal record. But U.S. District Judge William Terrell Hodges said Snipes exhibited a "history of contempt over a period of time" for U.S. tax laws, and granted prosecutors the three year sentence they requested — one year for each of Snipes' convictions of willfully failing to file a tax return. Snipes apologized while reading from a written statement for his "costly mistakes," but never mentioned the word taxes.